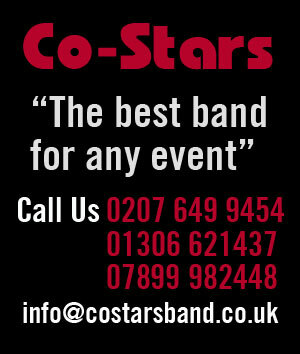 THE CO-STARS – the best wedding and party band! 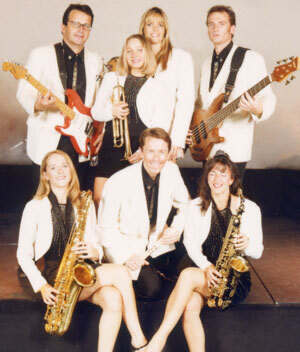 The Co-Stars are the UK’s most versatile wedding and party band, pictured here as a six piece but can expand to an eight piece. All girl brass section with male and female lead vocals. Probably one of the best bands for weddings and corporate events for any number of guests, large or small, with an innate ability to read any audience. As well as being very visual they also guarantee to fill the dance floor. Our band can scale up from a 5 piece to a Big Band, suitable for whatever size of event. The Co-stars were honoured to perform for Prince William and Kate Middleton to a full dance floor, which was mentioned in the Daily Telegraph. Thank you and the band so much for Friday. It was fantastic and the guests, and I, loved it! What can I really say about last Friday what a night you produced? EVERYBODY said if we do another event, you HAVE to do it. Thank you for “bravura performance” at Simon and Caroline’s Wedding. HELPFUL HINTS & VALUE FOR MONEY! The Co-Stars line-up is also available in Black and White!